Helena Thompson’s avant-garde art-sound project does not disappoint. ‘Unsteady‘ opens with jarring vocals but it soon becomes clear that this matters to PSP. The discerning listener may be speculative until ‘You Inspire Me‘ punches him or her in the face with driving drum and bass interaction, reverse symbol synths and heavy melodic fuzz. 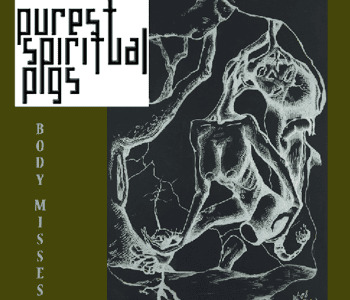 The vocals are moodily simple but they compliment the sound design: their lyrical content and its context within the music draws a song out of soundscape, becoming focal throughout ‘Body Misses‘. ‘Shenti‘ and ‘Damn‘ have a groove reminiscent of Massive Attack, whilst moaning guitars speak of rending metal and an industrial movement. Focus is on the deployment of sound, marrying melodic simplicity with well engineered layer design. Here, repetition is key to album progression, though it is sometimes detrimental to the drive of the individual songs. The design comes into its own in ‘Three Thieves Gone‘: haunting acoustics and simple synth movements precede a mournful recital. 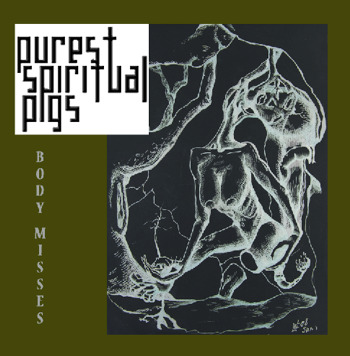 PSP have developed a style in their soundscape, transcending “song” and entering “album”, and doing so without an objective “concept”. This carries into ‘Burnt Through‘ which begins like a Reason software demo and develops into a poetic confession riddled with emotive bass and a hoard of noise mechanics that seem to contain the subplot of the song. Once again the lyrical and musical content blends so well that we are presented with an intricate and unexplored poetry of sound. ‘M.J.R‘ uses new techniques for PSP, incorporating softer but more dominant acoustics and simpler structure. It feels a little like an interval though, standing out stylistically without standing out in many other ways. ‘Remains‘ is an introduction to our delicate moments. Clever sound design leads this piece from the atmospheric to the punchy. There are folk elements to the vocals and moments reminiscent of Marilyn Manson‘s ‘Mechanical Animals‘, then there are snatches that move like Thee Silver Mt. Zion’s ‘God Bless Our Dead Marines‘. Yet all is blended so smoothly that it slides into our ears with sly ease. Lyrics drop under the radar in favour of stylistics but good composition makes this work for PSP. With vocals that crawl from another Manson classic, ‘Portrait Of An American Family‘, the heaviness of ‘Picking Myself Up‘ contrasts with the previous tracks so that it screams “single!” Building simple layers, it gives way to crunching guitars and a megaphone’s scream, giving way themselves to a cleaner industrial groove. A masterfully constructed piece of music as well as a radio-pleaser; it is the clamber upwards and the dragging industry. It is to dance to. And with a gradual falling apart of the layers in its final moments it self destructs, making way for a coup de grâce. Meanwhile ‘Blood-Let‘ features tribal drumming with supporting bass that peels away here and there to dance with the rhythmic drive of guitars. Full of eastern motifs, one can feel the presence of Tool. Continuing to build, it adds to the sense that these last few tracks are a mountain on the soundscape. Eventually, a soft outro leaves us hanging on the finale. The plateau on the analogical mountain, ‘Fpnop-Ppl‘ is a noise track with vocals garbled beyond decipher, metallic screams and a persistently soft jangling that penetrates the fuzz of distortion until a human breath ends the movement of ‘Body Misses‘. Experimental and industrial, poetic and ambient, PSP have found a niche we can only hope they explore to greater depths. Some of the songs drag in their own right and are difficult to listen to, but the album has an importance, and a fullness an attention to detail that cannot be ignored.